Deckboats seem to be gaining almost exponentially in popularity and there's probably good reason. The main factor seems to be versatility. Since most manufacturers are building them on a slight variation of their normal modified or deep-vee hull design, modern deckboats offer virtually the same smooth and crisp handling characteristics, but due to the increased bow area, not only more outright passenger room, but probably more comfortable room at that. 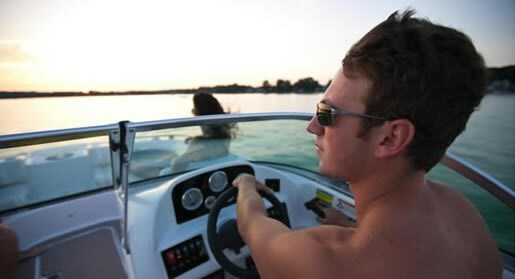 With a properly equipped deckboat you can enjoy every form of watersports including skiing, tubing, and wakeboarding, you can use it as a swimming platform, for beaching, and for carrying most of your family and guests for cruising or exploring. You can even use them as a platform for fishing. Where does Hurricane fit into all this? This Indiana boatbuilder has "been the deck boat leader for more than 25 years." In fact, for 2012, Hurricane builds nothing but variations of one form or another of deckboat in staggering numbers. To be precise, Hurricane builds an incredible thirty-six models of deckboats in three different series from 18 to 26 feet! Hurricane "builds more deck boats than everyone else combined." Hurricane's Sundeck series have more the traditional runabout look with a full windshield and centre walk-thru to the bow section. The Sundeck Sport series offer a centre or side console helm configuration and are more geared to fishing. The Fundeck series look all the world like a normal pontoon boat with side "railings" but on a full fibreglass hull. Hurricane states that its boats are "the ultimate SUV on the water with superior comfort, styling and performance." "Our wide-body hulls are designed with precisely positioned sponsons, lifting strakes and a reverse chine design. You're on plane quickly, enjoying the smoothest of rides and a shallow draft." The SD 187OB Sundeck, subject of this review, exemplifies all that is a Hurricane deckboat, albeit the smallest it builds. It is also available in a sterndrive version, the SD 187I/O. But let's concentrate on the outboard version. "...three out of every four outboard deck boats sold is a Hurricane." Amazing statistics. But perhaps here's why. The available seating for an eighteen footer is amazing. An L-shaped lounge stretches all the way from the passenger helm down the portside and across the full width of the transom. It features a complete back bolster the entire way including at the passenger helm allowing that passenger to comfortably face rearward in a lounge or spotter position. At the starboard transom, a removable cushion allows ready access to the two-section swim platform on each side of the outboard motor. The driver has a dedicated adjustable swivel bucket seat. The bow section ahead of the full wraparound windshield with opening centre section comprises more than half of the total boat length. It too has full wraparound U-shaped lounge seating with complimentary cushioned backrest the entire way around. The starboard side coaming moulding incorporates an indentation allowing easier dockside access directly into the bow area. Centre bow section access is provided to the full-width forward platform which is considerable larger than the two-section stern platform. 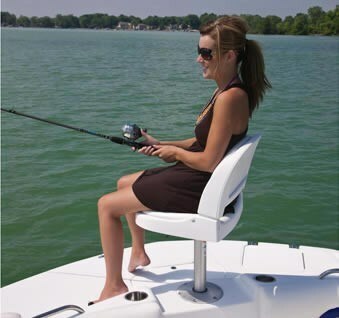 There is even a built-in seat base for a fishing chair. Also included up front is a second telescoping boarding ladder concealed under a hinged hatch. 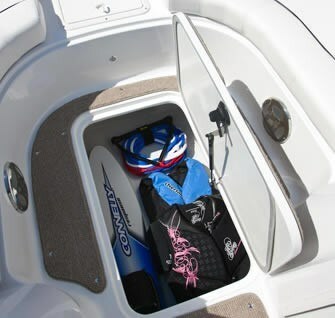 Storage is everywhere including under all seating plus on the bow platform, the step leading up to this platform and under the bow section floor for larger watersports accessories. Hurricane provides all of the essentials in the base boat but offers a substantial list of options allowing you to build your boat exactly to your needs. For example, included on this option list are items such as a colour-coordinated stainless steel canopy for those keeping their boat mostly outdoors instead of the standard aluminum canopy supplied. Other items such as a boat cover, stereo upgrades including i-Pod & MP3 adapters and holders, a transom remote control, or even a Sirius Satellite upgrade over the standard Sony stereo. Snap-in carpet, dual batteries, docking lights, or a fixed ski tow bar are all optionally available as is a stern fresh water washdown, regular or deluxe fish seat, rod storage clips and a trolling motor harness with plug. A livewell with pump is also available – good for fishing or for keeping refreshments cool. A depth sounder is optional as is a tilt steering wheel with or without hydraulic steering. You can get bow filler cushions and even a privacy changing curtain and a porta potti if you so choose. A Preferred Option Group puts several of the above family cruising options into a single package. If you are in the market for a deckboat, you definitely owe it to yourself to check out the enormous and varied selection available from Hurricane.